I've been gluten-free and vegan for about three and a half years now, and I've become increasingly more aware of what that means for not only my diet, but other aspects of my life. Lately, my focus has been all about my beauty products! A few months ago, I was using a new shampoo and conditioner when I realized my hands were breaking out in a rash and feeling extremely bizarre. My head was crazy itchy as well, and upon further inspection, I realized both products contained wheat. WHAT THE HECK. I didn't even know my wheat allergy would cause that kind of reaction, but it did. Ever since, I've made a much more intentional effort to check the ingredients of the products I purchase and use! Here's a round-up of the things I've been loving lately! Please know that this is a work in progress and such an ongoing process, and I'm also certain that I haven't gotten it perfect. I'm sure there are sneaky ingredients with funky names that are in these products that aren't totally clean or gf or vegan, but I'm doing the best I can. If you do know of anything on this list that isn't gluten-free or vegan, please please let me know so I can make note of it! We're all in this process together. Alba Good & Clean Pore Purifying Mini Peel (about $5, I got it at Target) // I've only tried this once, but I really liked it! 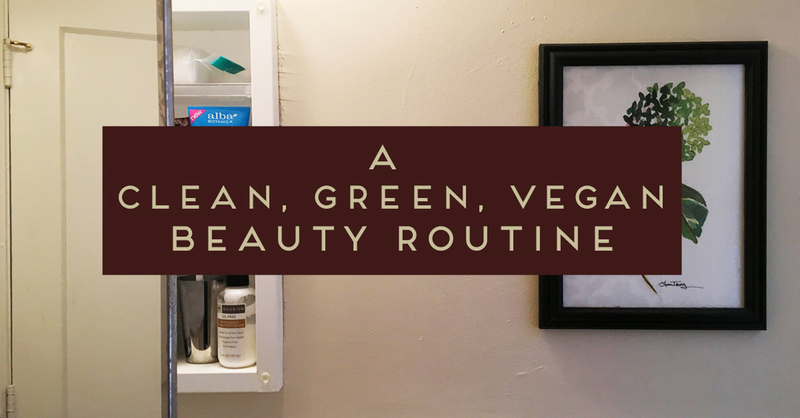 It's not a traditional face mask that is colored and hardens-- it's clear and just gets a little tight as you wait the 5 minutes, but I did notice my skin felt great after and I'm definitely working this into my weekly routine! Homemade face wash (I used this recipe!) // Because I have tons of essential oils now, I decided to try my hand at making my own face wash. A simple google search led me to this recipe, and I'm really liking it! I didn't know how it would act at first since it has coconut oil which hardens at room temp, but it's held up well. It was a little watery the first few uses, but has now gotten to be a little thicker which I like better. The baking soda adds a good amount of exfoliation that doesn't leave my face feeling raw, and the oils make it smell really fresh and clean in a natural way that I adore these days. OSEA Atmosphere Protection Cream ($44) // Okay, disclaimer. I would never spend $44 on face lotion. EVER. This one came in my latest Causebox, but I really am liking it a lot! This company is 100% natural and vegan, made with organic algae, and cruelty-free. All good things. This bottle is that soft frosted glass that feels soft, and it just feels so fancy every time I use it. I'll be sad when this ends. Trader Joe's Antioxidant Facial Moisturizer (I think about $4? at Trader Joe's) // When the above lotion does run out, I'll be back to using this simple and MUCH cheaper lotion! It's unscented which isn't my favorite thing ever (I like a little scent to make it feel fresh, ya know?) but it works well, is natural, and is cheap. Win. LUSH Tea Tree Water (about $11, online or in stores) // I've never been a complicated beauty routine person, and honestly, didn't even use to be a daily face-washing person (I know, I know). Using this toner water after I wash my face has totally changed that though-- after just one use that showed me how much stuff was still on my face after I thought it was clean convinced me I needed to get better about my habits! I love this stuff, and am basically just obsessed with tea tree oil in general. LUSH 9 to 5 Cleansing Lotion (about $11, online or in stores) // This has taken some getting used to. I'm not 100% obsessed yet, but I like it more than the oily eye makeup remover I was using before. It comes out like a lotion, so it was bizarre at first to rub it on my eyes, but a little organic cotton ball with this lotion does the trick for getting my eye makeup off! Khushi Spa lip scrub ($14, online only as far as I know) // This stuff is so great. It's made with brown sugar and oils, so it's totally safe to have on your lips to get them soft! It works like magic, and you're even encouraged to lick it off after you've rubbed it together. This saved my lips this winter! Burt's Bees Herbal Blemish Stick ($8, I bought it at Target) // This stuff is my go-to for breakouts, and I adore it. I roll it on before bed and almost always wake up to much clearer skin. I don't use it daily, only as a spot treatment, but it's great and as natural as it can get. No crazy drying chemicals here! Trader Joe's Tea Tree Tingle shampoo and conditioner ($3.99 each, in TJ stores) // This was an impulse buy, but it's been great. I'm always trying new shampoos and conditioners (girls, this is a thing, right?) and I might just settle on these for a while. It's a really different hair washing experience when the smell isn't super floral or fruity or fake like so many are... this one is minty and it feels slightly tingly and it just feels CLEAN. I love it. I don't notice the smell in my hair after my shower like I used to with other shampoos, but honestly, it's things like this that make me realize I don't want heavily perfumed things on my body or in my hair anyway, so I'm good with just a faint smell if I really sniff my hair. It makes my hair feel super clean without any residue or heaviness or anything else that's icky. Caldrea Essentials Collection Mango Lily Body Wash (about $9, at Target) // The smell of this is just heavenly. It comes out very much as a thick gel, so a little goes a long way, and it's just so great. I layer this with the lotion and love the sweet and summery scent! Caldrea Essentials Collection Mango Lily Body Lotion (about $9, bought at Target) // I'm obsessed with this lotion-- it's my daily go-to now! It gives just enough light, fresh scent to make me feel like I smell good all day (this is important!) but not too much that I get a headache or feel like it's cloying. I'm sad at how fast I'm going through this, because this scent is no longer at my Target! Boo. Jason 84% Aloe Vera Hand and Body Lotion (about $8, I got mine at the grocery store in the natural section) // This is my favorite basic lotion. The scent is really gentle but it's great for moisturizing and doesn't feel greasy or sticky or anything weird. I always wait to find this on sale at Target or my grocery store! Tom's long-lasting deodorant ($5, I got mine at Target) // The smell of this is definitely natural and not fake like so many deodorants are, which could be a pretty big change if you're used to the Secret/Dove/Ban type of stuff. I really like this though and find that it works well without making me freak out about cancer-causing chemicals or anything like that. Also, pro tip, put your deodorant on before bed! It has time to absorb and works so much better! Khushi Spa healing balm ($20, online only as far as I know) // This is part of my right-before-bed routine. It goes on my feet, hands, and elbows, and it makes them soft as can be when I wake up. I adore it. Super pure and simple (I know what all the few ingredients are!) and scented with lavender and geranium EOs. Again, a winter saving grace for all the areas of my skin that usually get super dry. LUSH Celebrate Hand and Body Lotion (about $15, might be sold out now!) // This stuff is seriously my favorite. I got it during a crazy LUSH bogo sale, and just fell in love. The smell is perfectly citrusy which reminds me of summer, and a little bit goes a long way. I keep this one at my desk and use it religiously every morning! I can't get enough of LUSH products. Cleaning supplies! I just got a whole box of goodies from Grove Collaborative thanks to a fun little giveaway deal several bloggers I follow were a part of, so I'll share that post next week! Make-up and nail polish. I've been reading reviews and scouring the internet for all the info I can find... but give me your best recs in the comments! Any brands you're loving? Where are the good deals so I don't go broke just trying to have some vegan mascara?! Help a girl out! To make it even easier for you, you can shop some of these products directly right here! As always, your purchases help fund my green beauty product purchasing-- thank you!